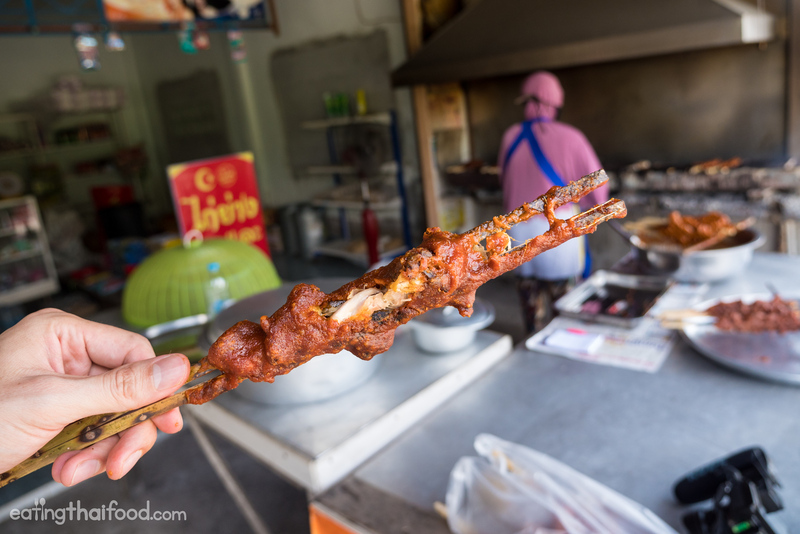 Thailand's Best Coconut Milk BBQ Chicken in Nakhon Si Thammarat! 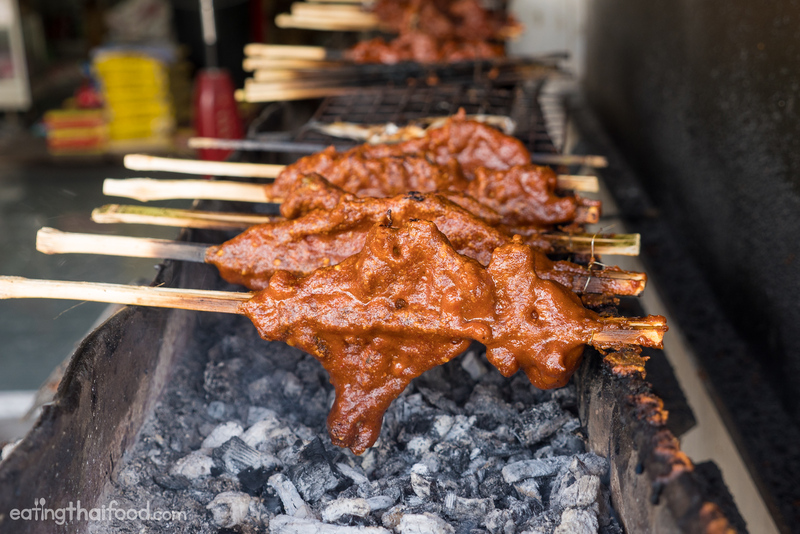 Thailand’s Best Coconut Milk BBQ Chicken in Nakhon Si Thammarat! To eat Thailand’s best coconut milk BBQ chicken (ไก่กอและ), you have to go to the tiny town of Hua Sai (หัวไทร), located on the coast of Nakhon Si Thammarat, Southern Thailand. There you’ll find a generations old coconut milk bbq chicken (ไก่กอและ gai galae in Thai) stall that’s worthy of a grilled chicken pilgrimage. If you have a few minutes, first click play to watch the video of this amazing grilled chicken. This family run Thai coconut milk bbq chicken is not only truly the best of the best, but it holds some pretty cool sentimental value for myself and my wife. 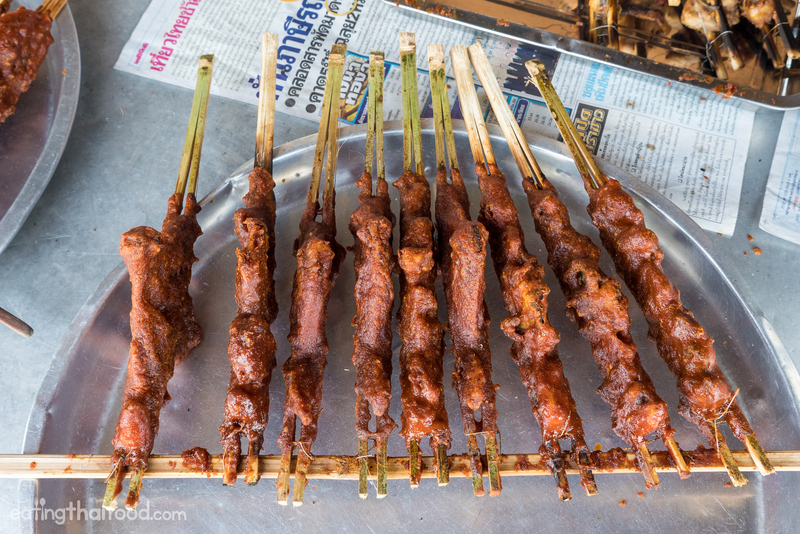 Over the years we’ve traveled around southern Thailand quite a bit, and I always enjoy eating gai galae (ไก่กอและ), southern Thai coconut milk bbq sauce grilled chicken. My wife’s family is originally from Hua Sai (หัวไทร), Nakhon Si Thammarat, but when my wife was born, her family moved to Krabi (great food in Krabi too). 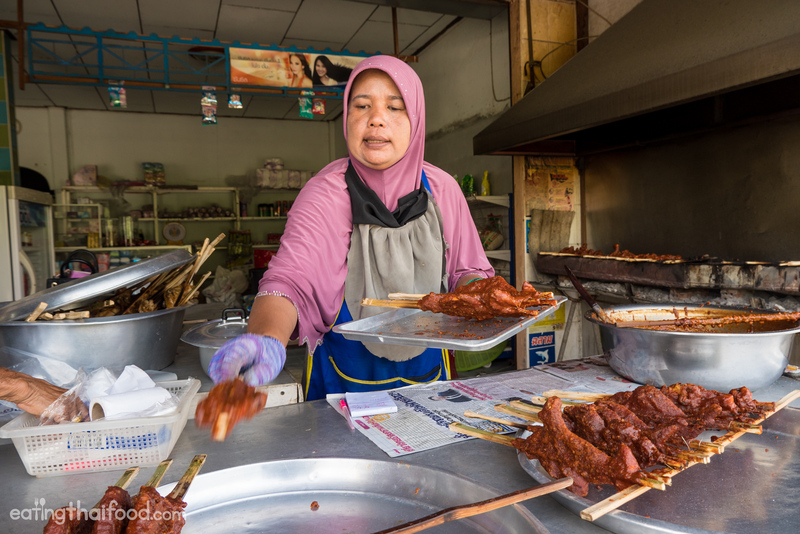 Every time they’d come back to visit relatives in Hua Sai, she tells me stories that her Father would drive straight to this chicken spot, without stopping first to see any relatives, and order at least 50 skewers. 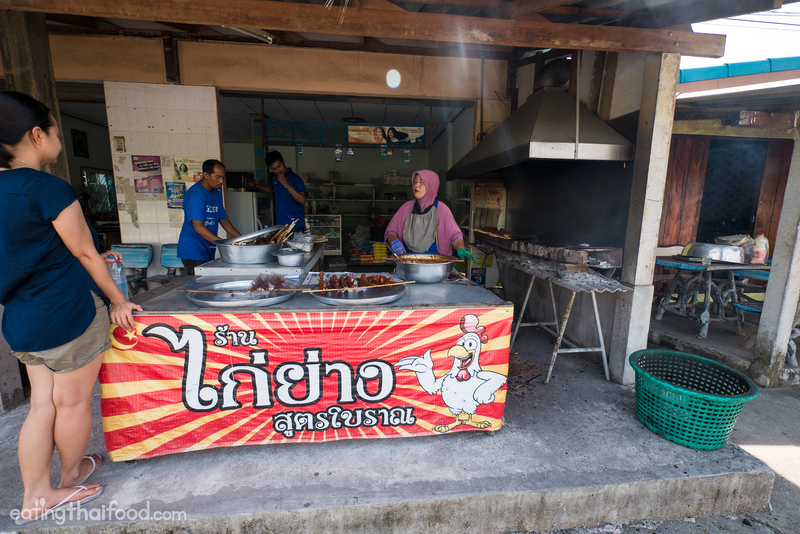 Finally, my wife and I were in Nakhon Si Thammarat, and we had a car, so we made the trip one morning to Hua Sai to check out the long lost bbq chicken (Ying hadn’t been there in probably 15 years or longer). We didn’t even know if it was still in existence, but I was so incredibly excited to go! From Nakhon Si Thammarat town, it was about a 45 minute drive to Hua Sai, located right on the coast, just a short distance from Thailand’s Songkhla province. We arrived and both of us were almost in shock at how it was still open and flourishing. It might be one of the liveliest places in all of Hua Sai. The Aunty who is now in charge (who is the daughter of the original owner), said she remembered and knew Ying’s Father well, and that her Father was good friends with Ying’s Father. Unfortunately, the original owner passed away not too long ago. 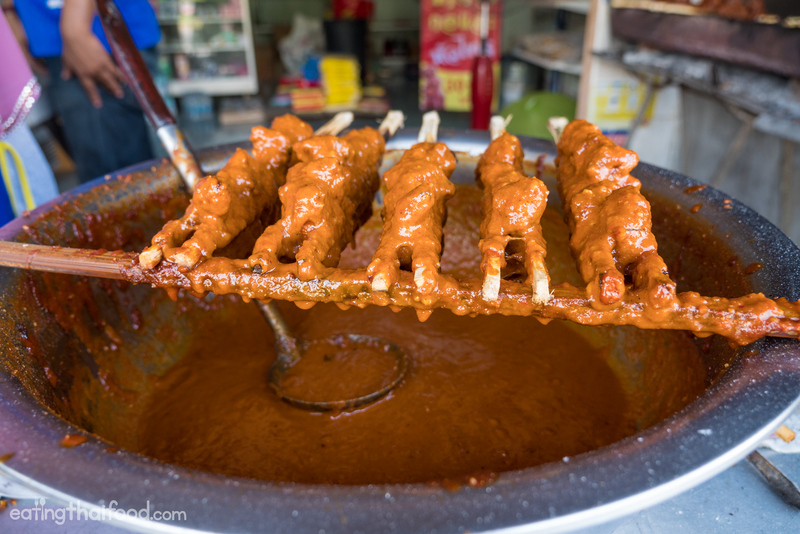 Gai galae (ไก่กอและ) is southern Thai style of grilled chicken coated in a thick layer of coconut milk barbecue sauce. 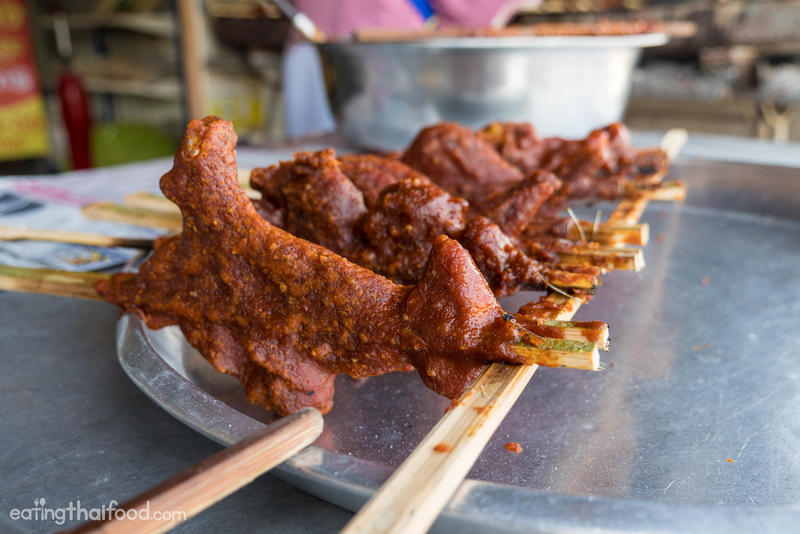 You’ll find it all over southern Thailand, and you know it’s being served when you see the bright red skewers of chicken on the grill. It’s sweet and salty, packed with the flavor of coconut milk and dry chili, and so rich and creamy. At Gai Yang Galae Hua Sai (ไก่ย่างกอและหัวไทร) in Hua Sai (หัวไทร), they only use coconut cream, peanuts, palm sugar, red chili, and probably salt, in their recipe, and I think that’s just about it. There are two main reasons why Gai Yang Galae Hua Sai (ไก่ย่างกอและหัวไทร) is the best in Thailand. Their coconut bbq sauce is made from pure coconut cream. 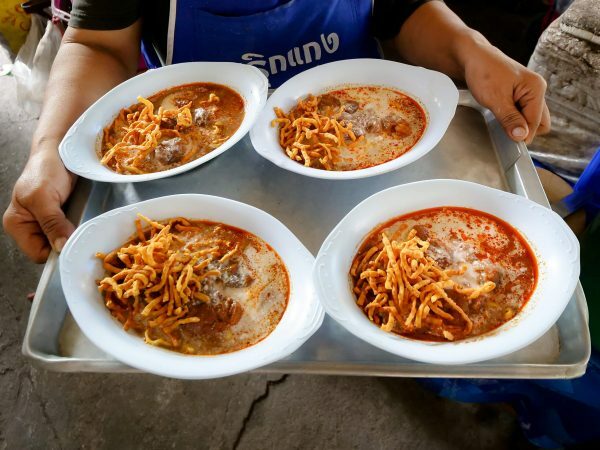 Some other vendors in Thailand will add flour to stretch out the coconut milk and make it cheaper, and last longer, but that reduced the density of coconut milk flavor. They have a unique grilling technique where they coat the chicken in bbq sauce, grill it, then air dry, and they repeat the process three time. It’s intensive and time consuming. 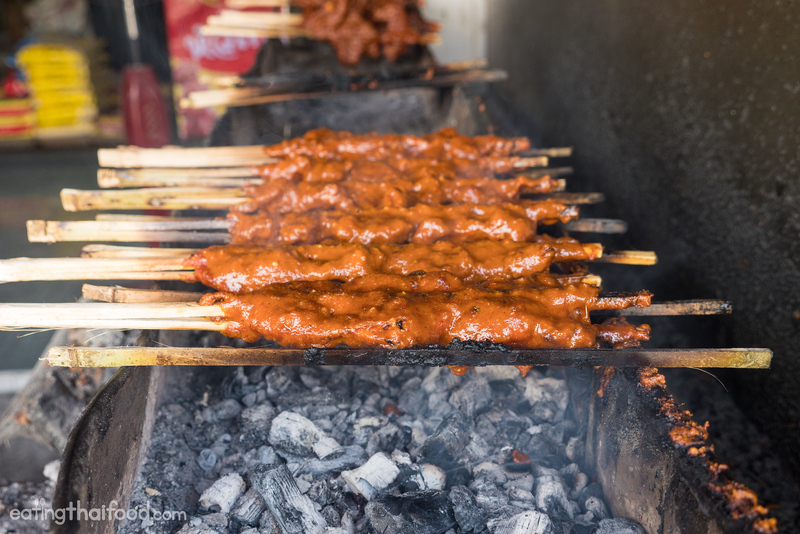 In order to make the grilled chicken at Gai Yang Galae Hua Sai (ไก่ย่างกอและหัวไทร), they first skewer the chicken pieces, similar to other styles of grilled chicken in Thailand, and then grill them for a short period over the hot coals. The chicken is then coated in a thick layer of the coconut milk bbq sauce and left to drain. It’s then grilled again, over low coals, until the coconut cream starts to caramelize and slightly dehydrate. The chicken is taken off the grill, air dried, for a while, and then it’s transferred back to the basin of coconut cream bbq sauce and coated once again. Back on the grill again! Again, the chicken goes back on the grill to slowly dry and cook over the low coals. Three layers of bbq sauce, and three times on the grill, and the chicken is finally ready. It’s a time consuming process, that’s almost impossible to find anywhere else in Thailand. The gai galae (ไก่กอและ) air drys one more time before it’s ready to be sold and consumed. My first bite was one of those bites that you can only chew and close your eyes – one of those transcendent, life changing bites of food. The coconut milk bbq sauce is literally caked onto each piece of chicken in a thick and crusty layer. You can taste the incredible richness of the coconut cream, the red dry chilies, and the nuttiness of the sauce. Inside, the chicken remains tender, and not the slightest bit dried out, but just soaked with an abundance of coconut milk. Gai Yang Galae Hua Sai (ไก่ย่างกอและหัวไทร) makes what is easily one of the best versions of southern Thai coconut milk bbq grilled chicken in all of Thailand. The recipe for their bbq sauce is based on pure coconut cream with red chillies, and the chicken is grilled and coated in triple layers of bbq sauce. 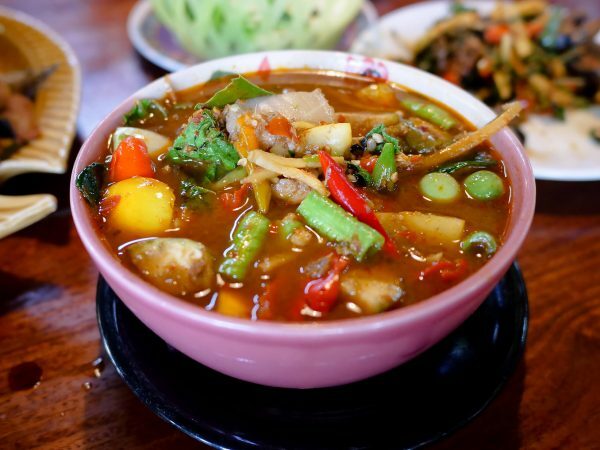 Taking a bite of gai galae in the small town of Hua Sai, Nakhon Si Thammarat, is a transcendent Thai food experience. Address: Hua Sai, Thailand, on the coast road. Check the map for details. Open hours: 4 am – 2 pm or until sold out, which can be earlier, on Monday – Saturday. I want eating now 555. Great photos! 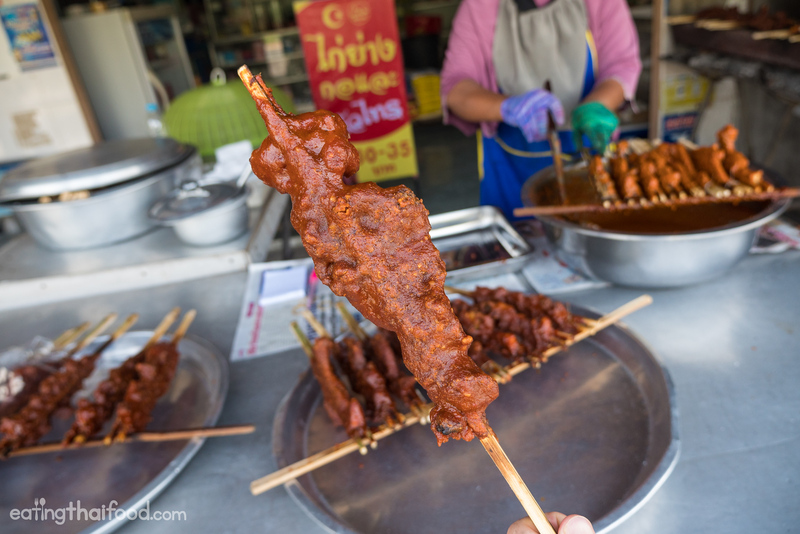 Fantastic video – we are visiting Southern Thailand including Khanom and Nakhon Sri thammarat this summer we will definitely pay a visit to try this grilled chicken. If you are ever in the area we can recommend Phato in Chumphon for some fantastic traditional food. I wonder how much red chilies they put on this recipe. I tried doing this chicken bbq but I wasn’t able to get the same taste just like the ones being sold in Gai Gale. Is there an actual recipe for this I can follow? also mark where can I order or buy the split bamboo skewers that you use to cook the chicken? Hi Mark. the gai yang galae hua sai recipe plzzzz……. love your blog. love your videos. how about a recipe for Gai Yang Galae Hua Sai or at least some idea of the ratios of red chilis to peanuts to coconut cream ?? also, looked through your store but can’t find the SOM TAM t-shirts …. First off. I’m so happy you do the searching and traveling you do. It’s great to have such exposure to unvisited parts of the country. I’d love to make at home, so I’m curious if you happen to have the foundational components of the recipe Do you happen to have that? Todo se mira delicioso! kiero probar esas delicias Mark wiens, , mi hijo Daniel Soltero abrió su pg en YouTube, ,espero y la mires aber k te párese, , tu y Daniel Soltero son mi # 1 :) :) :) me da mucho gusto cuando te miro a ti y a tu familia en las videos ,,,tu hijo es muy hermoso! ! ! no me pierdo cada uno de tus videos, ,son muy interesantes todos !! d todo corazón t felicito por tus logros, ,, espero cada video con Muchas ilusiones, ,, yo amo taylandia y su deliciosa comida ! ! ! besos tu baby ,,, espero k ahora si podamos conocernos cuando tengas un espacio en tu ajena ,,, un abrazo, Chao. I wish they had something like this in NYC! Great stuff! Will have to reacquaint myself with the south next time I’m over. So what were the sour leaves? Did you ever find out? Hi. Loved this chicken. In Malaysia its called Ayam Percik. Its available every where dat sells Muslim food . The word Galae probably comes from the the Pattani Malay accent which in Malay is Golek,meaning’ to turn’ or roll on the stove or abv a fire. . The recipe is the almost d same except v may not put in peanuts n probably pre marinated first. Its is also cooked using coconut shells instead of charcoal n more fragrant. A much liked dish especially in d east coast side of Malaysia in Kelantan. Eaten with rice,raw vege n sambal belacan(nam phrik kapi) or even v some nam budu if u like. Heavenly. You got that right. It actually is Ayam Golek and it is halal. By the looks of the owner she seems to be Muslim and the chicken is halal, I’m I right? Wonderful post as always. A recipe would be great! I can’t seem to find anything which looks similar (and uses coconut milk/cream). hi sir, may I know the exact ingredients of this bbq sauce? thank u and more power..